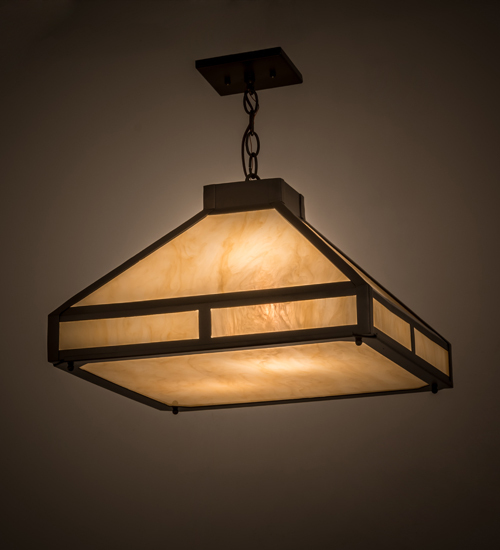 Description: This stunning transitional ceiling pendant is designed with appealing Sahara Taupe Idalight panels, including a matching bottom diffuser, which are enhanced with a frame, decorative accents and hardware featured in a Timeless Bronze finish. The perfect lighting centerpiece that will enhance any decor for fine homes, restaurants, boutiques and hotels, this pendant is custom crafted in the Meyda facility in Yorkville, NY. Custom sizes, styles, colors and energy efficient lamping options are available. This pendant is UL and cUL listed for damp and dry locations.